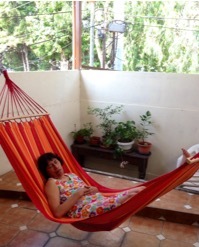 Quetzaltenango - enjoying the fruit 26 years later! It's hard to believe it was over 31 years ago that we moved to Quetzaltenango to start a church with three other families. There are now several congregations in the area and we got to share with two of them last Sunday. It is one of the many beautiful areas of the Guatemalan highlands, and the magnificent views of 12,300 foot Santa Maria Volcano and it's many moods are a constant reminder the amazing power of nature and the smallness of mankind. 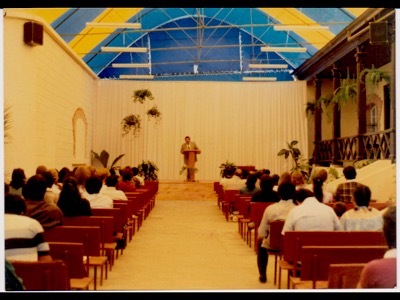 In January of 1984 we held the first formal Sunday meeting in our garage, complete with colored glass windows on the back wall. After a few months we had to relocate due to the rapid growth of our little group. It was non-stop learning curve, and God's grace was in abundant supply. In our second year the Lord gave me this design for a large awning covering the patio of this old stone house. This was the home for our growing congregation and eventually a primary school and small medical clinic, both of which served as an outreach to the community. 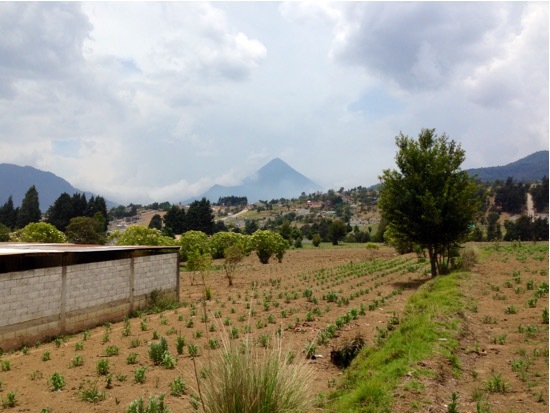 Our youngest son was born here, and we spent our last five years in Guatemala working with the church and building warm relationships with many wonderful people. So very many people who we knew back then came from all around to greet us and hear about our adventures with the Lord since getting assigned to Wales ten years ago. We were overwhelmed with the show of love and appreciation, and delighted to see so many of the young people from back then are now in leadership in the churches and following hard after the Lord. Our precious time there was spent with people that we have known and loved from so many years ago. 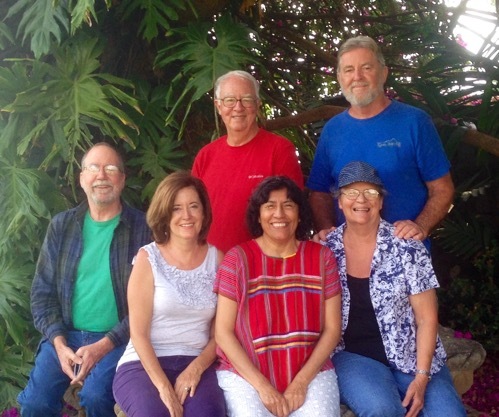 The Lord even arranged a few wonderful and totally unexpected meetings with friends from over 35 years ago. What an awesome God we serve and what wonderful love we are surrounded with in His family! To see these wonderful church facilities filled with believers and disciples of the Lord Jesus after our humble beginnings so many years ago was heartwarming indeed. We experienced the living proof that our labor in Christ never goes in vain. Among all this, the most exciting thing we discovered was from acouple who we knew as young singles when we left. 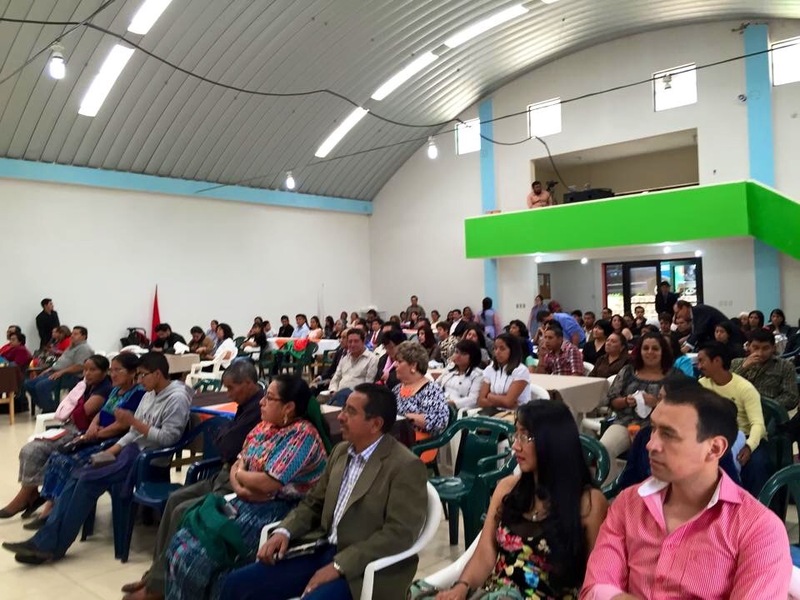 They are involved with a group who have received prophetic words and some remarkable visions from the Lord about revival breaking out in Quetzaltenango in great power, and spreading out to other parts of Guatemala. They are faithfully and rigorously praying for this coming outpouring of the Holy Spirit, and are even familiar with God's workings in Wales in 1904! So we were much encouraged as were they, and we have agreed to remember each other in our prayers for the coming times of much needed refreshing and revival in the nations. After a week in the capital city with Gladys's family and friends, we drove west into the beautiful highland region of Guatemala. 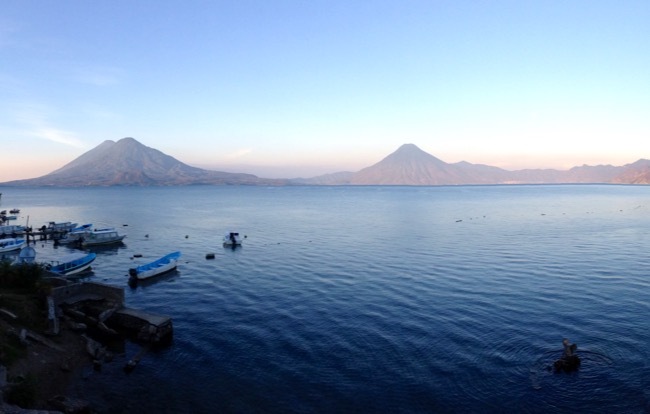 I made arrangements back in January to stay at this beautiful missionary compound on the shores of Lake Atitlán, in my opinion one of the most beautiful places on earth. Gladys and I stayed here several times in the mid-1980's when our children were little and we were starting the church in Quetzaltenango. En route we met up with our dear old friends and ministry partners Bob and Myra Trolese and James and Lynn Jankowiak. 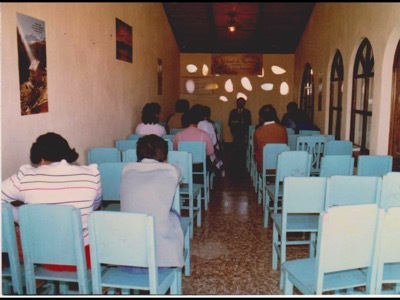 We were among the "original pioneers" that came down to help establish the relief effort and a Christian community and outreach in Guatemala after the 1976 earthquake. Bob is one of my oldest friends from where we came to the Lord in Northern California. 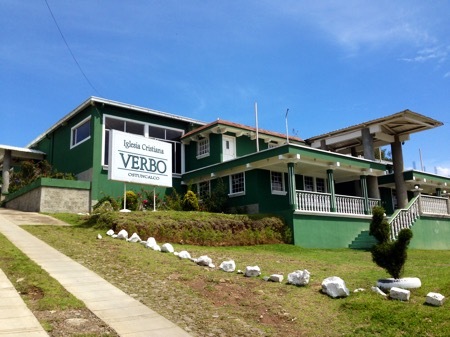 And this place, "Las Buenas Nuevas" (The Good News), is well known to all of us as we came here many times for leadership retreats in the early years of the ministry. We hadn't been together for 11 years so it was a special opportunity to spend time renewing our friendships and catching up with each other's family news and adventures. 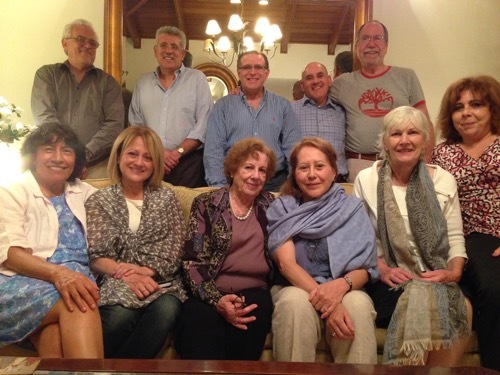 We spent great times remembering so many wonderful people and times in our years here and farther afield in Latin America. During our four days together we talked about almost everything the sun, laughed a lot, and just enjoyed being friends and family with one another under the same roof again! It was great fun to stroll through the streets and the market here and take in the local sights. All the beautiful colors and fabrics and amazing variety of handicrafts and other items designed for the tourist trade here form what is a key part of the local economy. Like everywhere else we've been, the town has grown immensely since we were here last, and it has become very busy hub of activity for locals and visitors alike. Gladys really loves being among her own people again, and in her own unique way she engages with folks everywhere she goes. 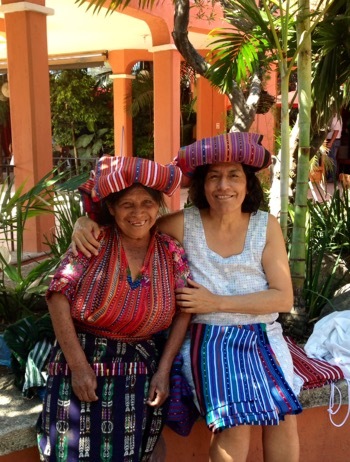 Here she has befriended this little indian lady who sells colorful woven goods for a living, and so she came away with something new to wear besides a new friend! 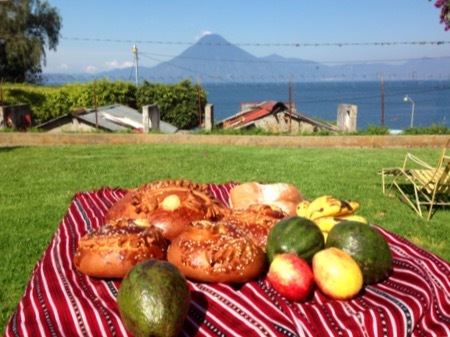 Welcome to beautiful Guatemala! Gladys and I arrived here Monday evening and have been having an amazing time already. 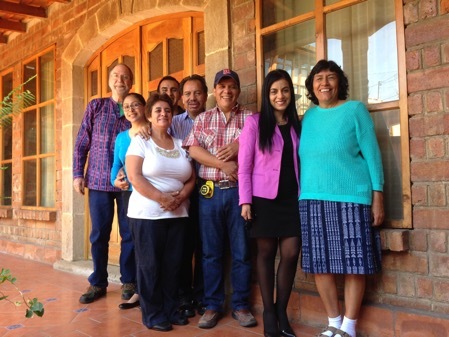 Our first night we stayed with some dear old friends and yesterday came to stay with Gladys's niece and her family. The climate is hot and wonderfully tropical, what a change! 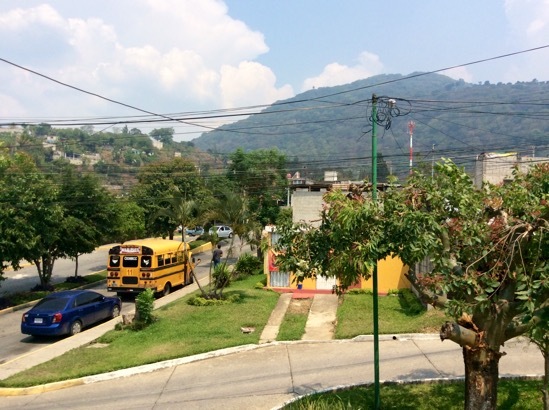 Gladys loves being here and walking through the neighborhood, and driving through the streets of the town of Amatitlan yesterday everything looked the same, except for the amount of people and traffic. All the little shops with their hand painted signs and wares hanging in the doorways, etc., seem so familiar that it strangely feels like home - sort of - until you leave the central area of town. As for me, I am in serious culture shock! 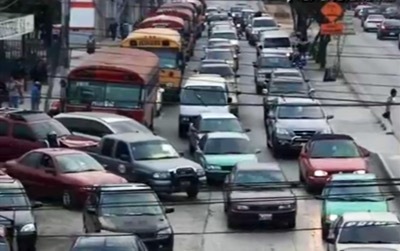 When I first came to Guatemala City in 1976, the city had well under a million inhabitants. But it quickly became surrounded by temporary settlements of people displaced by the massive earthquake that brought me here with a group to help in the reconstruction efforts and start a church community. Now there are nearly 5 million in the metro area. Where the city that I remember used to stop, it goes on seemingly without end and is totally unrecognizable. The roads are drastically different with confusing underpasses and ramps and curlicues, and I feel like a 4-year old lost in the circus! The traffic has multiplied 50 times over and is beyond belief. After three attempts yesterday to get out of the city we finally got to the last intersection that was a total free-for-all. It literally felt like this video showing a Welsh traffic jam! What a relief to make it to Gladys' niece's at least and just stop and be with family and relax a bit. Last night we had a wonderful time when we got together some old friends here. We were all part of a house group 31 years ago. We hadn't seen a few of them since then, and it was great to try and catch up on each other's news, families, etc. many are now grandparents, and the term "old friends" news takes on a different shade of meaning! The best part was to find them all walking with the Lord and growing in grace and love of God's ways. It was like a little piece of heaven, reminding us of what great things lie yet ahead.